Now that the taping and sanding and taping some more and sanding some more is done…. And the hoovering and dusting and hoovering some more and dusting some more is done…. It was time to hang wall paper. First, of course, we had a minor crisis. Mon mari is in charge of hanging wall paper. Like painting, it was decided eons ago that my work did not meet his standards. (No fool, I.) 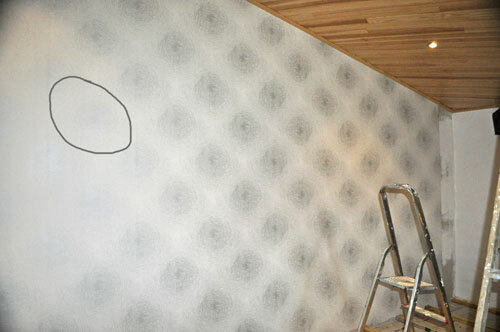 He is also in charge of determining the amounts of either wall paper or paint. I get to choose the actual paper or paint – with his approval, of course. As he laid the first roll of paper out to cut he realized it had a pattern (DUH!). He realized that the pattern had to be matched (Double DUH!). As it turns out, through careful cutting, and aided by the fact the the ceiling, therefore the walls, slant from 10 feet in the center to 6 1/2 feet on the outer walls, we had enough. Do you ever take a photo, and, when you look at it, wonder what the hell happened? Honest, this wall paper does not look like the old TV test pattern. It has silver, curving lines all over, with very light circles. The area I drew a circle around is what it looks like in real life. Apparently, all of the silver lines reflected the lights, making them appear darker. You’ll have to take my word that is really is nice – not dizzying. 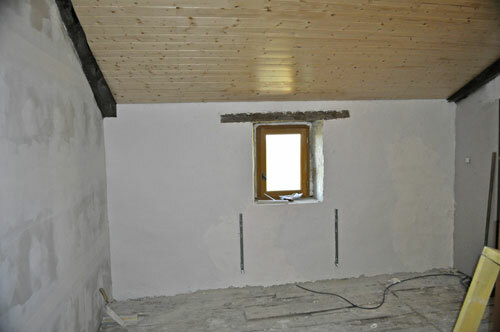 He also finished the outer, stone wall in the hall. In the photo (but also not in real life) it’s obvious that the color of the last bit of plaster is different from the rest. No worries….. It still has to be painted. A question: Do you have a tried and true recipe, that you make all the time, and, sometimes, it just isn’t right? I’ve been making this Red Cabbage for so long I can do it in my sleep, without my recipe, although I always give it a quick check to make sure I don’t forget something. I didn’t….. But this time it didn’t taste as good as usual. The flavor seemed less assertive than in the past…. Dare I say it? It was, well, almost bland. Still, there were leftovers (no surprise) that I wasn’t willing to give up on. This turned out so delicious, I’m keeping the idea for even when the Cabbage is perfect. If you’re still in the mood for Christmas stories – along with the recipe for Red Cabbage is a story about the best and worst Christmas present I ever got – when I was 5…. Sauté shallots and garlic in oil. Add chicken and brown on both sides. Add cabbage, vinegar, wine, stock base and paprika. Partially cover and simmer for 15 minutes. Remove chicken ane keep warm. Increase heat under cabbage and reduce liquid to 3 – 4 tbs. Stir in yogurt, return chicken to pan to heat through. I’ve never seen red cabbage prepared this way! Sounds delicious. 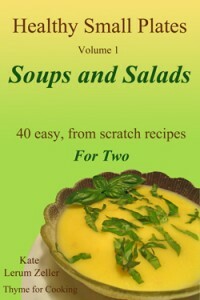 Katie – this looks delicious, I must try this recipe. 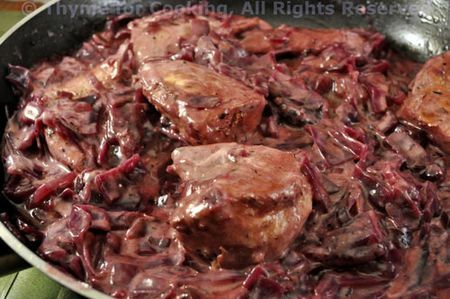 We usually make a red cabbage – very similar and serve as a side dish with sausages. Or we make pickled red cabbage which is delicious too! I love the beams and the ceiling – gorgeous! This sounds like a solid dish to me! And great work done with the wallpaper and hallway – bravo to your hubby! I’ve never seen a chicken-cabbage casseroel before. Can’t wait to try it. Katie, I like your style, you rule! Your cabbage recipe sounds great, looks delicious! Yes, I just recently did that—cooked a garlic grits dish I often make; it just wasn’t right and I had no idea why. Joanne, and excellent strategy that works well all through life! Ina, I don’t know what happened to this batch – just wasn’t right. But this fixed it. Pam, why does that happen?!?!? We should have it down pat!